Our Travel Experts are a bit like superheroes, really. They swoop in, red capes flowing, and rescue you from your pit of travel confusion, answering your travel related questions and coming up with perfect solutions just for you. OK, so we may be making up the red capes bit, but the rest is all true. Our Travel Experts are here every week to be your very own super heroes, so email us with your travel questions, and we’ll put them here on the Blog for our Experts to answer. Well Gina, 2 weeks is the perfect amount of time to explore East Africa. Searching for the Big 5 in the Masai Mara, sunsets over the Serengeti and relaxing on the beach in Zanzibar are just a few of the reasons why East Africa is my favourite part of the world. I’d suggest flying into Nairobi and starting your trip in this crazy capital. The Masai Mara is easily accessible from Nairobi. You can do a 3 day camping trip where you’ll be driven out to the National Reserve so you can spot plenty of wildlife on your game drives. You’ll also have the option of visiting the local Masai tribes and learning about their way of life. In East Africa even the most seasoned traveller can struggle to get around on public transport, so the best way to get from Nairobi down to Zanzibar is an an overland trip through Tanzania. The Nairobi to Zanzibar Adventure 10-day tour has an amazing itinerary – check it out. Departing from Nairobi, you’ll travel across the border into Tanzania. The bus journeys through East Africa are amazing, so take the time to enjoy the breathtaking scenery. You’ll never get tired of waiving at the children who will run after the bus and sing you songs! Through Tanzania the trip stops for game drives in the Serengeti so you can spot some more lions and elephants on the amazing endless plains. You’ll also get the chance to visit the Ngorongoro Crater, make sure you have your camera as you’ll want to remember these views. Finishing up in Zanzibar where you can go on a Spice Tour and find out about how Stone Town was involved in the slave trade. You can then go relax on the amazing beach, do some snorkelling, shop for local artwork, sample some of the fresh seafood and watch the sunset….perfect! A great place to start is in Johannesburg. Fly here and be whisked off to Kruger National Park on one of our Kruger safaris – we’ve got a few, so take your pick. Nothing could be more African than an afternoon game drive trying to spot lions, elephants and leopards before heading back to your camp for a traditional Braai (BBQ) and glass of South African Chenin Blanc! After this, you could take a short internal flight to Durban and join the 10-day South Africa Discoverer tour, which takes in the highlights of the South African coastline. You’ll be treated to rugged coastal viewed at Port St. Johns and Cintsa, dotted with the green mud huts of the traditional Xhosa villages. From here, its on to the adventure hub of South Africa – Storms River village! Whether the world’s highest bungee jump, canoeing, or abseiling is what you’re after, Storms River will have something for you. Next stop is Knysna where there are some beautiful walks for you to do. I would highly recommend spending the evening at one of the seafood restaurants at Knysna Quays for some mind-blowing sushi and world class oysters. Even if you think you don’t like them you have to try them here as they really are the best I’ve ever eaten and about 50p per oyster! Don’t miss a slightly bizarre stop in Oudtshoorn. 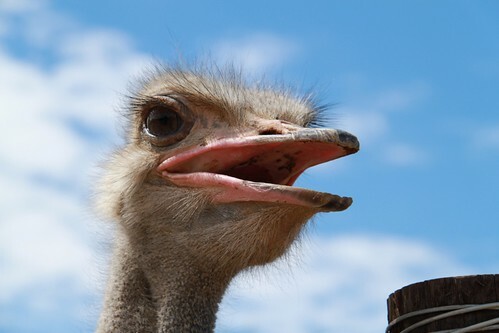 Here, you can hitch a ride on an ostrich (seriously), or skip that and tuck into an ostrich burger! Luckily, you’ll also find some some of the best wines South Africa has to offer here. Finally it’s on to my favourite city in the world – Cape Town! The list of things to do here is endless. Top of your list should be a trip out to the stunning Cape Point followed closely by a trip in the revolving cable car up Table Mountain for sweeping views of this awesome city. I really recommend asking your tour guide to arrange a ‘local dinner’ for you in Cape Town. You’ll visit a local township family, who will cook you a traditional meal and make you feel like one of them! It’s a great chance to really get under the skin of South Africa whilst knowing the proceeds are going right back into the community you’re sat in. I don’t know about you, but I’m torn! East Africa, South Africa – they both sound absolutely amazing. What about you? Let us know where you’d rather go, and if you’ve already been, have your two cents in the comments box below.